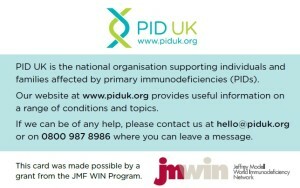 PID UK was pleased to announce the launch of their brand new Emergency Card funded by the Jeffrey Modell WIN programme. 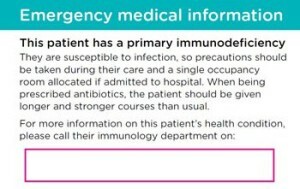 This card fits into a patients wallet or purse so that they can easily present it to any new medical staff member they may see who is not familiar with a PID diagnosis. The card has space on it for a patient to write their immunology clinics number on it for easy reference for themselves and the staff member.